Liverpool documentary The City That Rocked The World aired for the first time at the Philharmonic last night, Getintothis’ Alan O’Hare and Peter Guy discover a film sorely missing a beat. 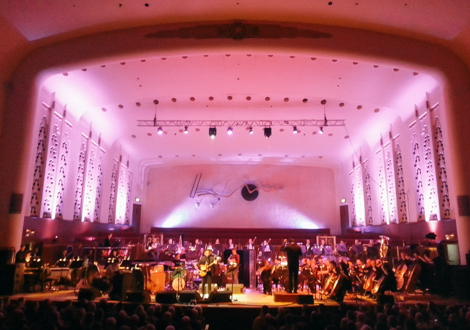 So sang Amsterdam‘s Ian Prowse, as the curtain rose behind him to reveal the big screen at the Liverpool Philharmonic Hall, for the premiere of The City That Rocked The World last night. The problem facing the Get Back films production, directed by Roger Appleton and and created by Gary Popper, is that we’ve never been allowed to forget about our city’s musical heritage. Sure, from the 70s onwards, it could be argued that the city’s population migration down south took some creatives with it – but, for the most part since The Beatles left town, they’ve continued to dominate our musical landscape. And we’re all well aware of it. It is. But nowhere near enough. Yet, perhaps there is little chance for a 100 minute film to capture the whole gestalt. The first hour of the picture is a treat for fans of nostalgia: talking heads from the days of jazz and skiffle at The Cavern wax lyrical about drinking coffee, tea chest basses and washboards. Lots of washboards. The Beatles and the rock ‘n’ roll scene that sprang up around the likes of Billy Fury, Rory Storm and The Swinging Blue Jeans (though apparently not, the conspicuous by their absence, Gerry & The Pacemakers) is well documented, with archive footage bringing the documentary to life – yet this is tempered by Southbank Show footage of Paul McCartney interviews lending the piece a TV movie feel. Further exacerbated by the tacky ‘chapter’ segments dicing the piece into uneven segments. The most interesting passage of discussion concerning the 60s is the allegations from the players of the time of a London ‘block’ on Liverpool music – that heads of labels in the big smoke had had enough of The Beatles taking control and blocked the progress of Merseyside rockers, in favour of Tottenham’s Dave Clark Five. Is it true? We’ll never know – as no further investigation is carried out in the film, we just segue into the next captioned segment. And herein lies a big issue: the documentary has no narrative (or narrator), outside of an historical timeline, to bring context. What we’re left with is a series of taxi pit-stops as the film’s executive producer and Sound City boss David Pichilingi and Mersey Beat creator, Bill Harry navigate several derelict shells of former music haunts to recount days gone by. The diminishing returns of the early to mid-70s are bypassed in the beat of a syncopated drum, with the under-appreciated The Real Thing providing a mere snippet of ‘You To Me Are Everything‘ – and suddenly – without touching upon the once thriving club scene around Toxteth we’re whisked forward to 1976 and Eric’s. The Mathew St club and its never-ending influence on the independent scene of the north west of England, inevitably is given more camera time – and the film shifts its attention to the pied piper figure of Roger Eagle. Even though he was not a Scouser, it is quite right and proper that Eagle takes his place in the centre of the feature and casts a long shadow – with Pete Wylie, Ian McCulloch and Jane Casey all extolling his virtues. The 80s bring Frankie Goes To Hollywood (who gloriously seem as provocative now as they did in their heyday), the 90s and the dance explosion of Cream swiftly followed by Cast and The Coral. And despite, interesting contributions from The Christians, James Barton and Deltasonic‘s Alan Wills, it all feels as quick as an Icicle Works drum fill. Why? Depth. If Litherland Town Hall and Bob Wooler get a mention for their place in the story of our omnipotent Fabs, what about the Bandwagon at The Zanzibar Club, EVOL at Korova or 3 Beat Records in Liverpool’s story of the last two decades? Dance culture is glossed over in all of two minutes as Barton and Casey offer Cream soundbites – when, the fact remains, the super club (and all its various spin-offs) is quite easily the biggest Liverpool music success story since The Beatles… and one that continues to have genuine global impact outside of the city. Merseyside’s modern melody makers get short shrift too with The Wombats (who have been around for close to a decade now) and LIPA taking the noughties plaudits. Esco Williams and Dominic Dunn are handed brief cameos, but nothing points the way to the solid and varied future that we know exists. Where are the dozen or so acts making headway in today’s music landscape? Where are the people providing the infrastructure that has reshaped Liverpool into the city leading the charge on a national scale? Where are the music producers, studios, promoters and people within the Liverpool of now making it happen. Where, indeed, are Atomic Kitten!?! Nowhere. Nothing here is untold – despite the fact that what we hear again is at times well shot and captured. The talking heads are interested and interesting. Faron Ruffley of Faron’s Flamingos yarn of attempting to plug an electric guitar into a wall socket and Will Sergeant‘s corking cameo (his assessment of the Liverpool ‘scene’ – “We were all in bands, but we all hated each other!“) providing lovely snippets of wit. The soundtrack is good, if predictable, too – the Bunnymen injecting some much-needed oomph. The venues are shot with a real spirit and honesty. But much is missing. Perhaps, post-Beatles, mainstream musical success has not been where Liverpool’s cultural strength has lay. Maybe our legacy rests (and continues to rest) with the intellectuals, itinerants and immigrants who make this village vital? 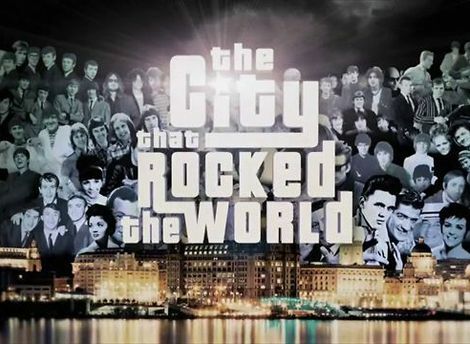 ‘The City That Rocked The World‘ scratches the surface of this – but doesn’t dive in. After all, who wants to make a film about a load of people the wider world might not have heard of? But perhaps the most telling element – and the reason why this film misses the mark – is the range of talking heads so keen to reiterate ‘Liverpool is so much more than The Beatles,’ – yet here is a piece of work revelling in the past, skirting round the future and focusing primarily on that very group. Make no mistake, it’s a tough brief to capture the melting pot of Liverpool’s music scene, past and present. But it’s one where the thrill of the chase should be more interesting than what makes the final cut here – and if The City That Rocked The World hoped to capture the ‘Pool of Life’ – they paint a picture of a musical landscape decidedly arid.